Sometimes, the simplest deterrent to crime is the best: keep things locked! 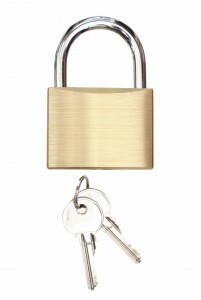 Commercial locks and keys are inexpensive and need no electricity. They will deter the casual intruder and slow down even the most expert criminal. 82% of all break-ins happen through the door. 14% of intrusion is through the window or slider. 4% are through broken glass. We can prevent 96% of all crime simply by using good door and window locks. All commercial locks are not the same. If you’ve been getting your locks from a hardware store or other mass outlet, you are not providing a serious deterrence against crooks. You have no control over who has keys to your locks, and over the life of the installation, you are probably paying more than you would from a locksmith for professional grade locks and keys. We recommend Medeco brand locks and keys. These are considerably more secure than any regular system. Medeco has figured out many of the ways a burglar would try to break in, and strengthened their locks accordingly. (See Eight Ways A Burglar Can Open Your Door.) Even the keys are special, with three crosscut angles that can’t be duplicated by a local key-copy location. This means that you must get duplicates from a Medeco dealer, and records are kept. It’s also easy for us to change just the keys and lock cylinders (not the whole lock) whenever you change employees or accessibility. This gives you more control and lower costs for years to come. Do you allow employees and others to borrow your set of keys? Is it OK for your employees to get their own duplicate keys? The Inside Secrets of a High Security Lock. Here’s a close-up look at the insides of a Medeco (top), versus a hardware store lock (bottom). 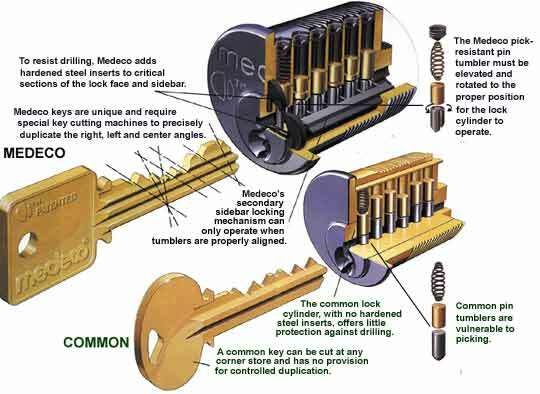 Medeco locks are high security because of the three vital features they include: pick resistance, physical strength, and key control. Thirty percent of all burglaries are unlawful entry without force – meaning the thief had a key! When it’s time to replace or improve your commercial locks, what would you rather have us do? If you insist, we can rekey your locks in a standard design that lets all your employees duplicate your keys. But we recommend that you let us rekey in a locksmith design (using Medeco or their KeyMark brand) in which only you can get your keys duplicated. What’s the additional cost? Minimal, by comparison, to the losses or harm you could incur. In fact, it’s much less than what you would pay for your child’s sneakers that you will throw away in six months! While you’re at it, getting rid of any hardware store commercial locks will not only strengthen your security, but also save you money in the long run. Why? Some cheap locks must be thrown out because they can’t be rekeyed. With better commercial locks, like Medeco, you simply replace the “guts”, the internal locking pins, to match a new key. We sell only premium brands. They are not only safe, but they add beauty and “curb appeal” to your building. Ask us about the most economical way to replace your old, non-secure locks. Northeast Security Solutions can also cut keys. We have over 22 specialty key cutting machines! We have one of the largest selections of key blanks in the area. We can cut the round tubular barrel keys, traditional house keys, automotive keys including the ones with the new chips in their heads, and the “laser” cut keys that are on some of the newer cars. We have the programmer to program almost all of the new automotive security keys. We can also cut skeleton keys, antique furniture keys, luggage keys, Best/Falcon I/C core keys, flat steel keys such as safe deposit box keys, and the list goes on! We even offer keys that only you can have duplicated such as the restricted Medeco, Mul-T-Lock, Assa and Kaba keys. If you are unsure of what type of key you have, do not hesitate to bring it to us and see if we have it – most likely we do!